2-room apartment 45 m2 on 3rd floor. Simple and cosy furnishings: living/dining room with 1 sofabed (140 cm, length 200 cm), cable TV. Exit to the balcony. 1 room with 2 beds (90 cm, length 200 cm). Open kitchen (oven, 4 ceramic glass hob hotplates, electric coffee machine). Shower/WC. Heating. Small balcony 7 m2, south facing position and west facing position. Balcony furniture. Partial view of the mountains and the Matterhorn. Facilities: Internet (WiFi, free). Please note: non-smokers only. Large, simple small apartment house Imperial, 4 storeys. In the district of Untere Matten, 300 m from the centre, in a central, quiet, sunny position, south facing position. For shared use: well-kept garden. In the house: lift, storage room for skis, central heating system. 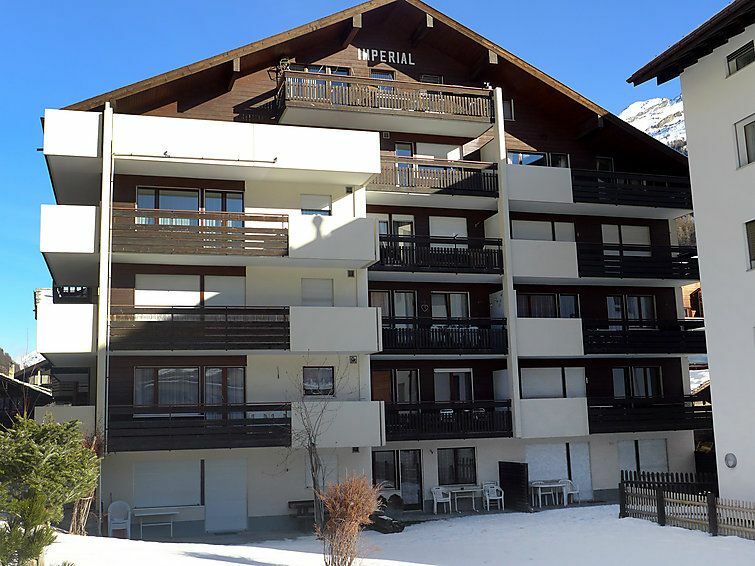 Supermarket, restaurant, bakery, bicycle rental 300 m, 5 minute walk to the centre, bus stop Wiestibrücke 150 m, railway station Bahnhof Zermatt 300 m. Mountain railway, ski rental 300 m, ski bus stop 150 m, ski school, children's ski school 550 m. Cabs cannot stop right in front of the house. Please note: There are more similar properties for rent in this same residence.